What size spacers for pull out pantry drawer? I have a pantry cabinet with a single door, 1/2” overlay on all sides. Buying Blum blumotion soft close hinges 110 degree. With 3mm plate. What size spacers do I need to use on the one side of the sliders to clear the door, since I won’t have zero clearance hinges? (Making new drawer boxes based on the spacers). Was considering using a zero protrusion hinge, but they all say 155 degree and I don’t want them to open that far, will hit fridge. If you want to play it safe…..go 2 inches. Thats more than i was expecting. Orignally i was guessing 3/4” to 1”. Hinges won’t be in the way, just the door itself. Hinges won t be in the way, just the door itself. I’m assuming your using the straight arm hinge with the 3mm plate? So 1” would work with plenty to spare. Using 71B35550 hinge, drilling cup at 5mm to get 1/2” overlay on door. Where do you find the protrusion details? I didn’t have any luck when searching, probably overlooked it. You have to download the brochure on Concealed hinges. Was considering using a zero protrusion hinge, but they all say 155 degree and I don t want them to open that far, will hit fridge. 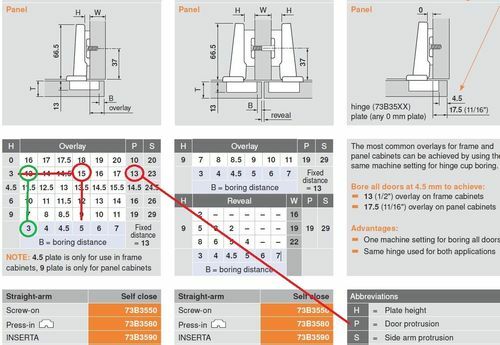 Blum 125 degree zero-protrusion hinge.